Sometimes you have to admit you are wrong. Not necessarily a bad thing. I tried something and it didn't work. Now I know! I have painted 18 wave studies on hemp canvas that I have gessoed and sanded myself. The hemp tends to wrinkle and buckle in places and probably could use at least 3 more coats of gesso, with a good sanding in between coats. It has not been the best surface to paint on and today, my frustration with it burst all bounds of patience. It is interfering with my painting. Therefore, out it goes. There will be a brief break in my wave studies while I wait for an order to arrive which will hopefully provide a better solution. 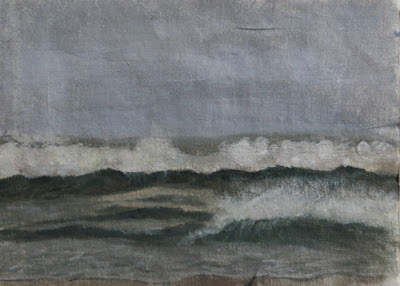 Part of the problem is I want to paint 100 wave studies and my budget is very very small. © 2013 R.L. 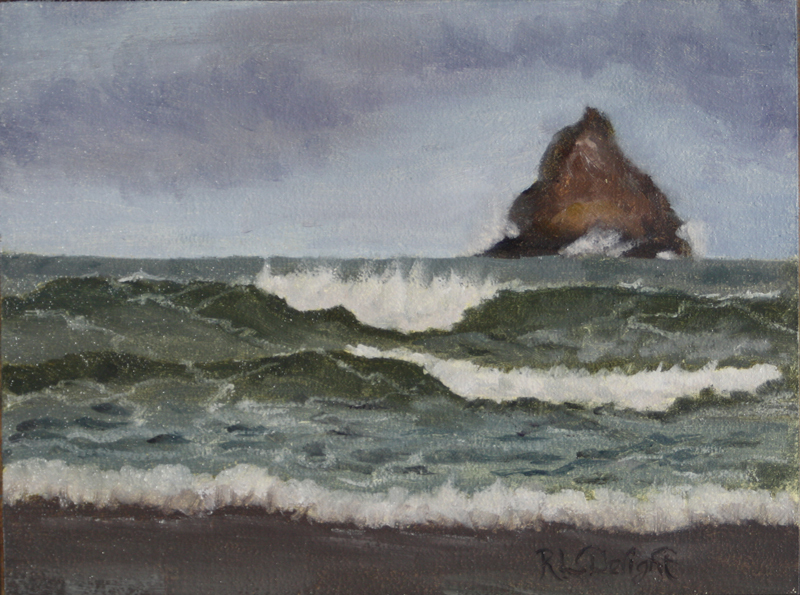 Delight, Wave Study #18, 6"x8", oil on hemp canvas. A red tide is moving through the area. I painted a bit of the reddish foam but it didn't show up well on the photo. There are signs up warning folks not to eat the shellfish. © 2013 R.L. Delight, "Incoming at Arch Cape", 6"x8", oil on linen panel. I think the lovely linen panels I have been using for this challenge have spoiled me for the homespun hemp canvases I was using. These panels are by SourceTek and are quite nice. The challenge has been, well, challenging. Doing a wave study and a finished painting is tough for me. It has been good too. I am getting faster at painting. I really do need to be working this much and more. I am learning a lot. That said, I am glad I will get a short break from wave studies as I need to catch up on a couple of things. I want to take a quick moment to thank everyone who has commented on my previous posts. I have hardly had time to get these posts up and check e-mail and business. I still need to get these on my website and DailyPaintworks so they can be sold! I also really need to get some foul weather gear, specially since I am beginning to suspect my rain pants may have fallen behind a log and got left behind at Arch Cape.